continued to 4th page Page 4th from every such & other vice, & that until such, the part they have a right to of my Estate or property, shall remain under the management of my Executors, and the interest arising therefrom, or if land, the rents to be given to them, as my Executors or majority of them shall think necessary, until they are satisfied of their being fully reclaimed, and when so, the property they have a right to, be delivered up to them & their heirs, as intended, and so it is to be with respect to the husband of Harriet, in case he should be unfortunate enough to get such a one as described of my Sons disposition, and the property allotted to her, to be under the same regulations & restrictions as my Sons above recited, in case her husband should deserve the same restrictions, from the same causes[? ], or his Conduct in any other manner. 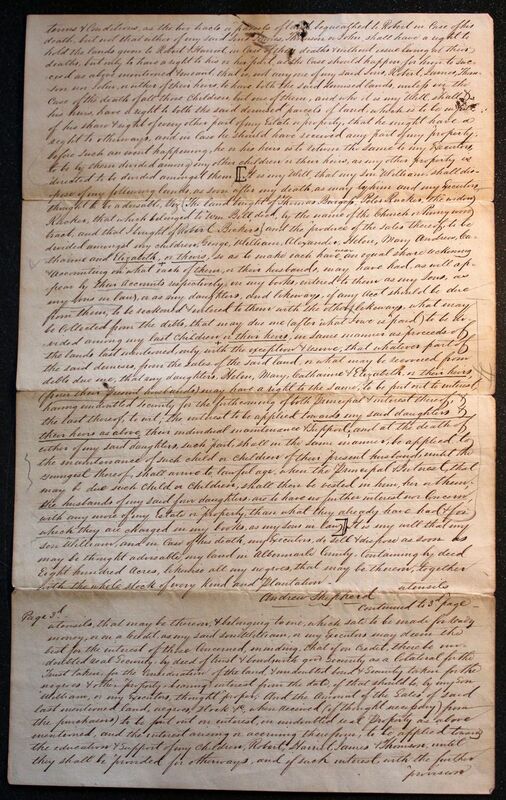 As it is my will & intention that all my children & their heirs, shall have an equal part of what Estate of property, I may have, including what either of them may have had, excepting him or her, who shall hold the lands particularly demised, as near to Valuation, as Can be Conveniently allotted by my Executors, and if any thing should be expressed, or any word omitted in the foregoing, that may occasion any dispute, with regard to the real meaning & intention thereof, the same shall be determined, by a Majority of my Executors, or such persons as they may choose for that purpose, either having a regard poses[?] my son William, information with regard to the Circumstance, he being fully acquainted with my intention & meaning of the whole premises, and I hope & beg, that every one concerned will be satisfied, without the least Grumbling of whatever, providence has pleased to entrust to me, over & above what was necessary for myself, and the rearing of them to what they are, and to be thankful to original donor thereof, be it little or much; as it will be necessary for an Inventory to be taken after my death, I desire that the persons who may be appointed for that purpose, may be as Convenient to the property as possible, but that there will be in necessity I hope for returning the Inventory into the office as any one who may be interested may see the Same, & take a Copy if they should want it, from my Son William, or my Executors, who may be be in possession thereof. 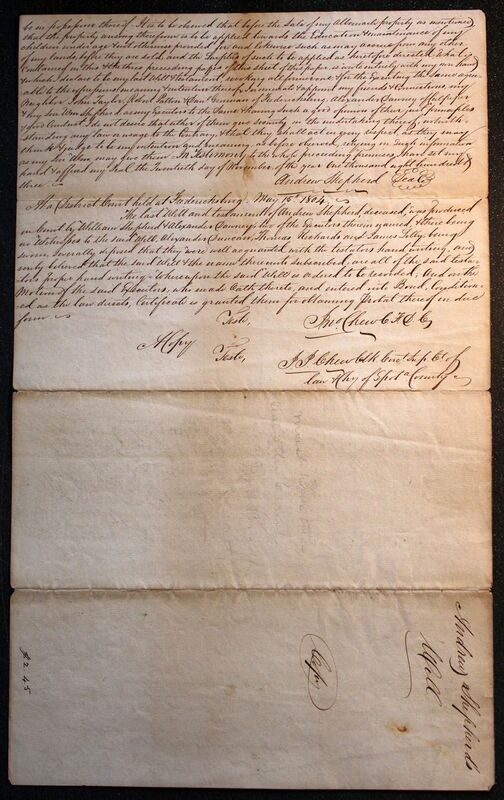 It is to be observed that before the Sale of my Albemarle property as mentioned that the property arising therefrom is to be applied towards the Education & maintenance of my children under age & not otherwise provided for, and likewise such as may accrue from any other of my lands, before they are sold, and the Surplus of such to be applied as heretofore directed, what is contained on this & the three preceeding pages of this sheet of this paper, is wrote entirely with my own hand & which declare to be my last will & testament, revoking all former one & for the Executing the Same agreeable to the expressions, meaning & intention thereof. 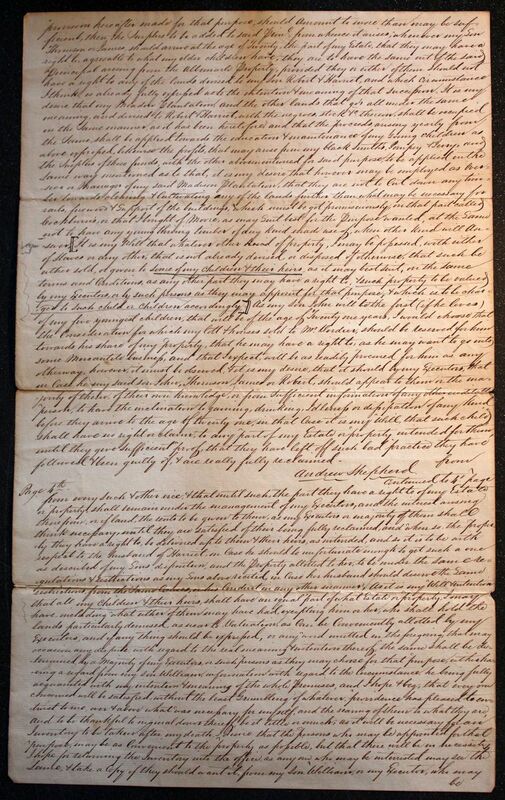 I nominate & appoint my friends & connections, my neighbor John Taylor, Robert Patton & Danl Griman of Fredericksburg, Alexander Dawney of Culpeper, & my son Wm Shepherd, as my Executors to the Same & having Such a good opinion of their just principles & good Conduct. I do not desire that either of them tie security in the undertaking thereof, notwithstanding any law or usage to the Contrary, & that they shall act in every respect, as they may think & judge to be my intention and meaning, as before observed, relying on Such information as my Son Wm may give them. In Testimony to the whole preceeding premises I have set my hand & affixed my seal, the Twentieth day of November, of the year one thousand eight hundred & three. At a District Court held at Fredericksburg. May 15th 1804. 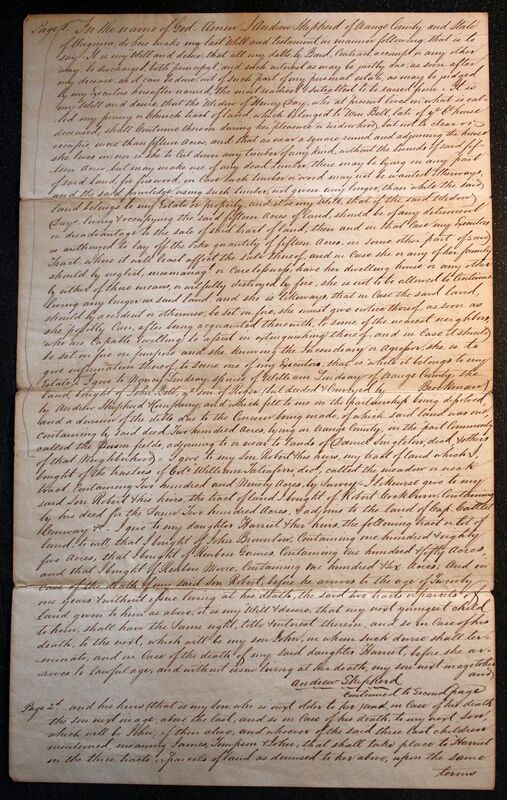 The last will and testament of Andrew Shepherd, deceased, was produced in Court by William Shepherd & Alexander Dawney, two of the Executors therein named, & there being no witnesses to the said will, Alexander Duncan, Thomas Richards and James Tilly, being sworn, severally deposed that they were well acquainted with the testators hand writing, and verily believed that the said will & name thereunto subscribed, are all of the said testators proper hand writing. Whereupon the said will is ordered to be recorded; and on the Motion of the said Executors, who made Oath thereto, and entered into Bond, Conditioned as the law directs, Certificate is granted them for obtaining probate thereof in due form. Teste, J. J. Chew Clk. Circt. Sup. Ct. of law & [illegible] of Spota[?] County.